You know that grilled Mexican-style corn that’s slathered in mayonnaise and Parmesan cheese, hemorrhoids lime and chili powder? It’s just delicious. All tangy, sweet and spicy. But have you ever tried to eat it in front of other people? Mayonnaise on your chin, mayonnaise on your lips, and sometimes, mayonnaise on your forehead. At times, this is just fine. Other times, you’d prefer to eat a bit more civilly. This grilled corn salad has all of the flavor of your mayo/parm/lime/chili corn on the cob without all the napkins, furious face-wiping and embarrassing teeth picking. This is a salad you could safely eat on a date, in front of co-workers, and even in front of Flickr-loving food bloggers. There are so many reasons why this is my favorite corn salad. Grilling the corn lets you cook with one hand on the tongs, one hand on your beer. It goes with pretty much anything, and especially with grilled burgers or sausages. The ingredients are easy to find and I usually have them in my fridge. But really, it just tastes so good. 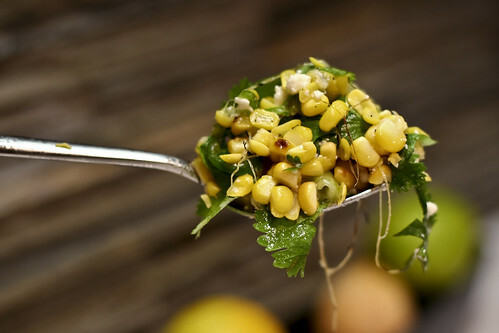 Corn’s beautiful and plentiful right now and this salad is a perfect way to eat it. If you don’t have a grill, you can make this salad just as easily by boiling or microwaving the corn. You’ll lose the charred, grill flavor, but it’ll still be quite tasty. Also, I’m pretty lazy about removing the silk (see image). Get your grill going at medium heat. Run the ears of corn under the faucet so that the husks get a wet, otherwise they’ll scorch. Place the corn on the heat and cook for about 5 – 6 minutes, turning them every minute or so. Remove from the heat and peel pack the husks, then return to the grill. Cook for another 5 – 7 minutes or so, turning the ears every minute. They should develop a nice, brown char on the kernels. If they look good, remove from heat and let cool a bit. Remove the kernels from the cob (good tips from Elise here). Toss the corn kernels with the other ingredients and serve. I ALWAYS have that dilemma about that way of eating corn! This looks like a great alternative. i love going to my daughters soccer games because the little vendors come around selling the corn on the cob with mayo much better than cold stale nachos (my sons baseball games) any day of the week. thank you for this recipe because i know it’s going to be a staple from now on. not only is the picture lovely, i am definitely going to make this version of corn salad. we make our pico de gallo with almost this as a base recipe. That corn salad looks good! I just discovered your wonderful blog, and wondered if there is a way to print just the recipe part of what you have written. Can you tell I am a computer novice? Thanks!